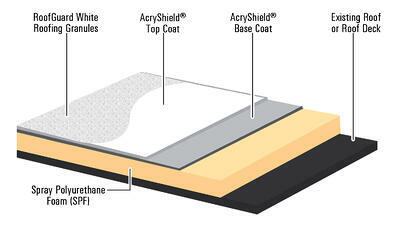 A590 offers superior performance and unique benefits for coating SPF roofing. Tests conducted by chemists at NCC have validated A590 is excellent at providing UV protection and exceptional adhesion over SPF roofing. This coating can be applied in a single pass, saving contractors money and time compared to the normal 2-3 coat application process. The UV blocking pigment levels in a gallon and a half application of AcryShield A590 are several times greater than the UV blocking pigments in the "standard" 3 gallon SPF roof coating process. The unique formulation provides exceptional durability and abrasion resistance as compared to standard roof coatings. The polymer used in AcryShield A590 has been successfully used by NCC in products and on roofs for more than 35 years, thus its long term durability and field performance are unmatched. Combining high durability with the highest 3-year solar reflectance and UV resistance yields an SPF roof coating that offers superior benefits for the SPF contractor. Once SPF is installed to manufacturer's specifications, the foam must be coating with a single layer of coating to protect the SPF from the sun's UV attack. Using AcryShield A590, only a single coating pass at a minimum of 12 dry mils need to be applied. This saves contractors time waiting for the first coat to dry and the labor and material costs involved with a second or third coat.